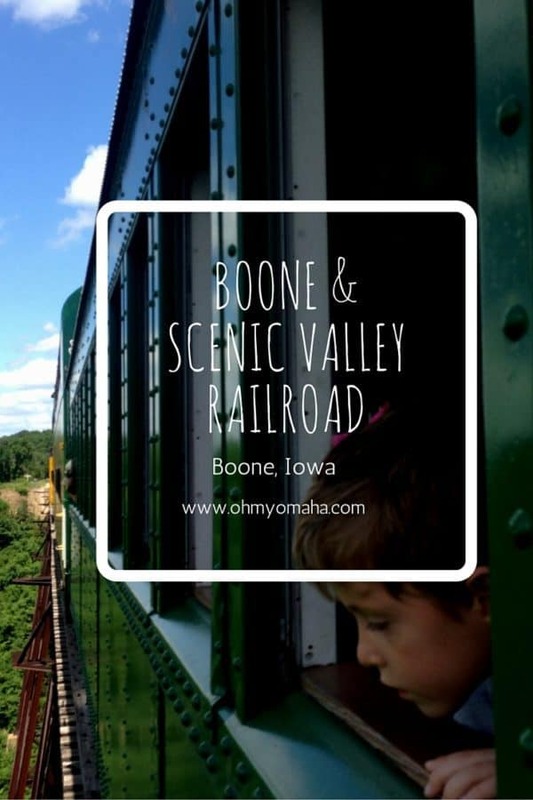 The only place you can take your kids on a steam engine train ride in Nebraska or Iowa is on the Boone & Scenic Valley Railroad in Boone, Iowa. My kids have a fixation on Thomas the Tank Engine, so I ask: How could I not take my kids on it when we were in the area? Disclosure: I received complimentary tickets in order to write this review. All thoughts, opinions and typos are my own. Boone is a small town between Des Moines and Clear Lake, our two main stops on our Great Iowa Road Trip. It’s about 2 1/2 hours from Omaha. We ended up with a diesel engine pulling our train, but no big deal – it didn’t dampen the experience of riding in on authentic train. – Expect to buy a ticket for anyone in your party who can walk (babe in arms do not need a ticket). – The train depot has a museum – admission is included with your train ticket – and a gift shop. Allow some time before your ride to walk through both, especially if you’ve planned this pit stop to be a chance to stretch your legs. Outside the train depot in Boone, Iowa. – The steam engine is used on the Saturdays, so when we went during the week, we had a diesel engine. That’s no big deal for me or the kids, it’s still a train ride. If it’s a big deal to you, go on a Saturday. – Your ride will not be air-conditioned – these are 1920s rail cars (though, dinner trains are enclosed with heating and air-conditioning). 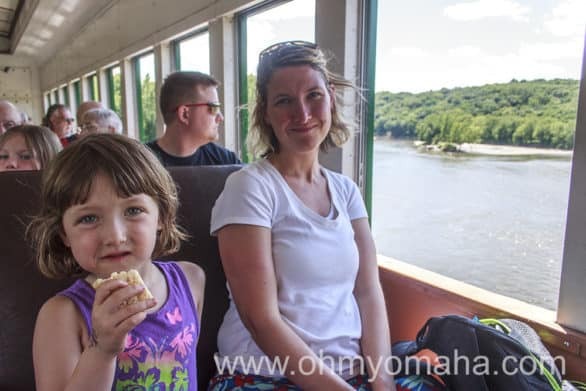 We went in June and thanks to some temperate weather, it was not a hot mess. It was, in fact, quite comfortable. The Boone & Scenic Valley Railroad 1920s era coach cars are not air-conditioned. On our trip in June, it was a comfortable ride without needing air-conditioning. – Seating is first come, first served in the coach cars. If you ride on the dinner or dessert train, your seats are reserved. We arrived late and had to ask a couple to switch seats so that the four of us could be seated together. Arrive early and avoid the hassle. Even on a weekday, the Boone & Scenic Valley Railroad cars can be crowded. It was for us on a Tuesday afternoon. – The ride is out and back, about an hour and a half ride. Each car has a volunteer who’ll share interesting facts about the train and the area you pass through. Ours shared the story about Kate Shelley on the way back to the station. – There is a concession car, but since the kids slept through lunch, I had also brought their lunch with us. I didn’t see anyone else eating. If you get tickets to ride in the caboose, you will not have access to the concession car. Mooch enjoyed her picnic on the train. The highlight has to be crossing the Bass Point Creek High Bridge, which you’ll do twice since it’s an out-and-back ride. If you’re afraid of heights, this will be the ultimate low. The Boone & Scenic Valley Railroad crosses the Bass Point Creek High Bridge, which, at 156 feet tall, is the tallest single-track interurban railroad bridge in the United States. It’s a doozy of a drop. We also liked the concession car. The kids got some ice cream, and Mr. Wonderful and I enjoyed a craft beer from a Boone brewery. Cheers! There are daily rides with the Boone & Scenic Valley Railroad, as well as regular dinner and dessert trains. From time to time, special themed events are planned – several I can see being very, very popular with families. Be sure to check the dates here as they may change. You will want to purchase your tickets in advance since these are popular. When: The classic excursion runs daily Memorial Day Weekend through Oct. 31 each year. It departs Sundays-Fridays at 1:30 p.m.; departs Saturdays at 1:30 and 4 p.m. Ride lasts about an hour and 45 minutes. Special events and dinner trains may have different start times and run on different dates outside the Memorial Day Weekend to Oct. 31 time frame. Always check dates and times before you go. 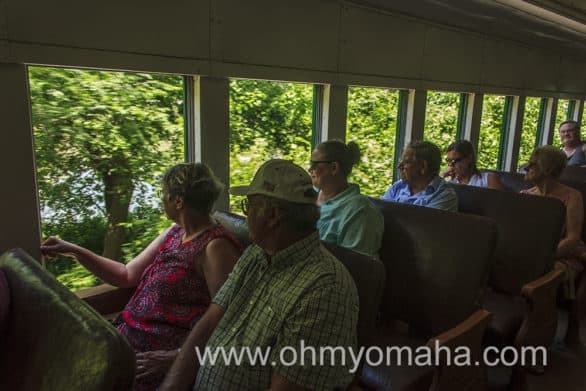 Cost: Classic Coach Class tickets are $22 for adults and $9 for children; Climate Controlled Coach is $27 for adults and $15 for children; Valley View is $32 for adults and $17 for children; and Caboose is $26 for adults and $14 for children. Special event train rides and dinner trains will likely have a different ticket price. 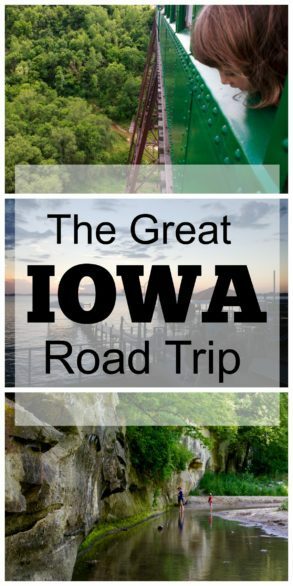 Since this trip, we’ve explored more Iowa cities you may be interested in checking out, including Orange City (with a great Tulip Festival), the Quad Cities, and even more of Des Moines. Trains. Either you like or you’re obessed with them. My son dabbles in obession when it comes to trains. He plays it cool whenever we show him a real train (I look like the excited fool, usually), so I don’t classify him as a fanatic. Do you have a fanatic in your house? 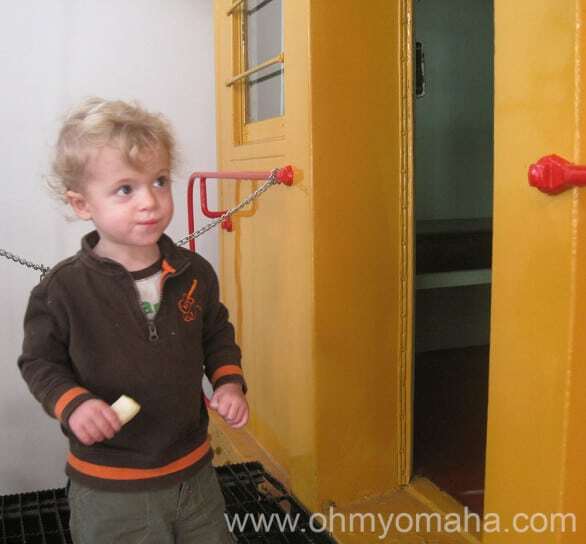 Exploring a caboose at The Durham Museum. With a cheese stick, naturally. Let’s start at what was once Union Station, Durham Museum. Kids love the real train cars you can walk through and the O Scale model railroad exhibit, as well as ringing the damn bell over and over again (you know which one I’m talking about). While there, get some ice cream at the old fashioned soda fountain. It’s not train related, but mama’s got to keep her energy up when out and about with excited train lovers. Lauritzen Gardens’ Model Railroad Garden featuring G-scale model trains running around a landscape of Omaha landmarks made out of natural materials is really neat to look at, not just for the kids, either. In the winter, it’s brought indoors and runs around their poinsettia exhibit. While at Lauritzen, jet on up the stairs to the south of the gardens to visit Kenefick Park. Check out two giant locomotives on display there. It’s free and open to the public. 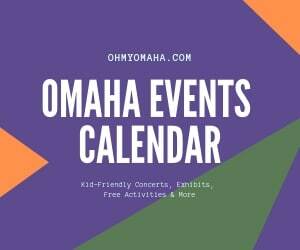 In Council Bluffs, you can take your kiddos to this museum for free! The newest exhibit, “Building America,” is interactive. 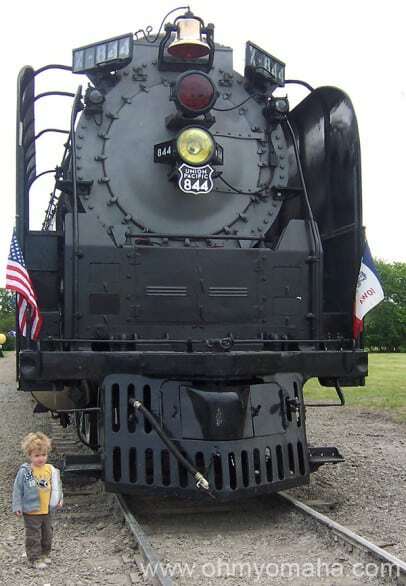 A massive steam engine Union Pacific rolled into Council Bluffs in 2012. While not actually part of the Union Pacific Railroad Museum, I wanted to include this shot because UP does this sort of thing every year. Kids love getting up close to these giants and walking through the cars. For free! While you’re not going to spot a ton of train stuff here, I thought I’d mention this Bluffs National Historic Landmark. Dodge has been called “the greatest railroad builder of all time,” so if your train lover appreciates history, this is a good place to visit. Good to note, children 6 and younger are admitted free. 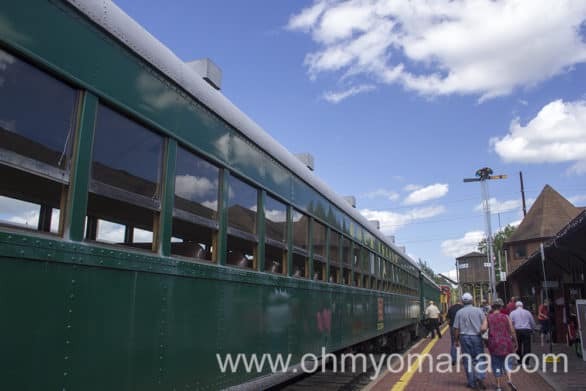 A restored train depot, the museum features railcars on display outdoors that kids will like checking out up close. Inside, check out the large model railroad display. This museum lacks the funding of some of the other locations on this list, so it’s not as polished or new-looking, but your kids won’t care. Trains are trains. I have yet to visit this set up at the Mall of the Bluffs, but I know and trust the reporter who wrote about it (story here) – so I’m including it. The Nebraska-Iowa Model Railroaders Club has set up shop at this Council Bluffs mall and on Saturdays, the public is invited to stop by and check it from 11 a.m. to 4 p.m.
Doesn’t matter who you are, if a 2-year-old invites you to a picnic in a tiny train car, you go on a picnic in a tiny train car. You can check out a park located in the Bemis Park neighborhood that has playground equipment shaped like a train. 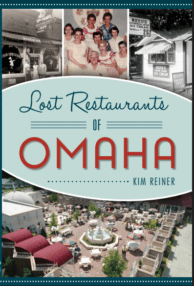 OK, it’s more of a place that I’d rather go without my kids, but if since we’re talking trains, one of the newer restaurants in Omaha celebrates Omaha’s railroading history. Railcar Modern American Kitchen is at 144th and Blondo streets. The Sunday Brunch menu does have a kids breakfast listed. Council Bluffs has the Golden Spike, which commemorates the junction of the Union Pacific and Central Pacific rail lines at the Promontory Summit, Utah, in 1869. There’s not much to see or do there, but if your kid likes trains and history, why not check it out? Along that train of thought (pun intended), swing by the Lincoln Monument while in C.B. From this site, Lincoln viewed and selected the Eastern Terminus of the first transcontinental railroad built on the United States. 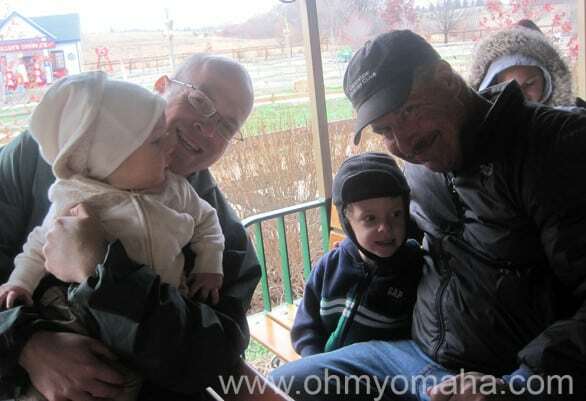 Mooch and Farley take a cold train ride with their dad and Grampy at Vala’s Pumpkin Patch. Want to ride a train? 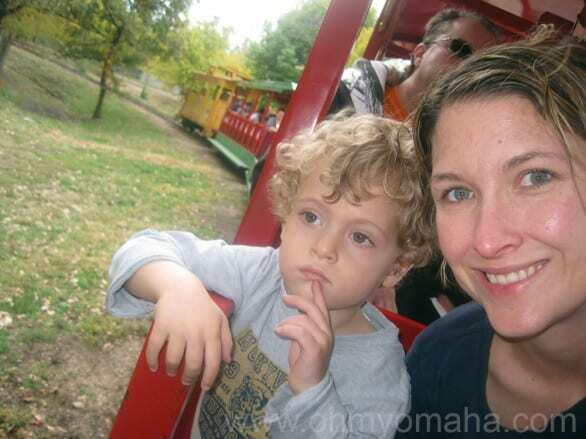 Omaha’s Henry Doorly Zoo & Aquarium has one, as does Vala’s Pumpkin Patch. 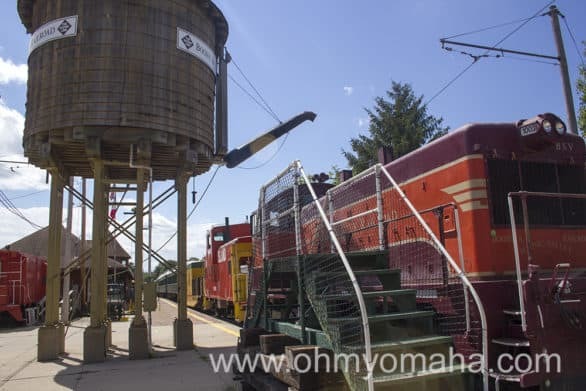 Every July, Railroad Days is celebrated at several locations on this list There are activities planned at each place. The perk of this event is that family admission is very reasonable and it’s good for both days. Omaha also has its share of little kid-friendly train tables where kids are welcome to build tracks and play until their heart’s content. Stop by one of the two Barnes & Noble locations, where you’ll find the train set in the children’s department. Omaha Children’s Museum has a train table in its Wiggle Room.